Martinez has hit safely in all eight games for Boston. … Rodriguez recorded his 500th career strikeout in the first when he got Khris Davis swinging to end the inning. 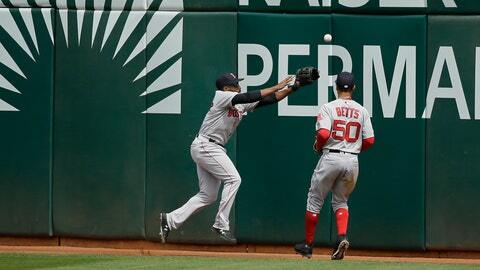 … The Red Sox are 16-38 in their past 54 games at Oakland and 3-13-1 in their past 17 full series at the Coliseum. Athletics: A day after being hit by a pitch on his surgically repaired left wrist, 3B Matt Chapman was out of the lineup on Thursday but came into the game in the eighth inning. Manager Bob Melvin said the move was precautionary. Chapman underwent left wrist surgery in 2015. … Utilityman Chad Pinder took Chapman’s spot at third. … 1B Matt Olson (right hand surgery) took ground balls for third time on Thursday.